Furnished apartments in Dubai are often ultra-modern with little unique style or flair, as this can lead to them looking like a hotel room! It can be hard to make rental properties in Dubai look and feel like home; therefore we have interior design inspiration on how to decorate even the smallest of Dubai flats to make the most of your space and city living. From selecting the right furniture, to finding a balance between modern and classic, we've got ideas on Dubai home décor that you need to know. With the help of leading Dubai furniture stores IDdesign, KARE and Chattels & More we have tops tips on creating the perfect home (even if it's a studio flat) from the bedroom aesthetic and the living room arrangement to the office furniture. 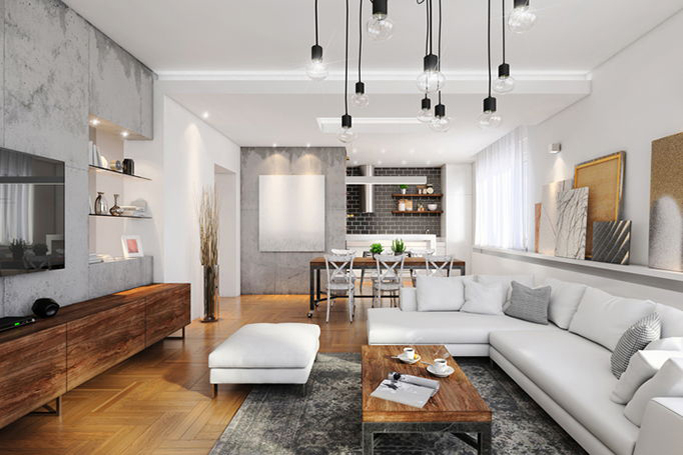 Although you can pick many styles to compliment your apartment, this season we recommend hints of industrial themed home décor, which adapts to Dubai living with loft vibes for apartments and flats this theme gives an urban edge to stylish design. Renovating old trends with a modern twist, bold and beautiful furniture from Chattels & More, IDdesign and KARE takes us back to the turn of the century when wooden, rustic and exposed steel furniture were undeniably luxurious and still cosy. From a feature chair which fits perfectly in an empty corner, to a slim cabinet which doesn’t overcrowd your space, harmonising your apartment can often be difficult but with the right balance of furniture pieces you can make any space work. As this Rodeo Zick Zack unit from KARE is made from cowhide trim and has an urban rugged charm with a unique style. It's not too big to dominate the room, but can make an interesting decorative feature and has draws for storage too! We love the mango wood grain which will contrast and still compliment modern furnishings. Or brass! No matter how small the space you still need statement pieces of furniture and decorative items which will make your apartment more lived in and homely. From these interesting Changkir corner tables from Chattels & More to alternative coffee tables, these home pieces fit perfectly with the industrial decor theme and can surprising compliment any room. Keep an eye out for unique home furnishings and accessories in Dubai as you don't just want your apartment to look like every other! Be bold and experiment with pieces like this creative Chattels & More sideboard and not be afraid to add dark furniture into smaller spaces, as long as it is balanced and with the rest of the room. Place this piece beneath a window so the light can enhance it. Don’t forget that the walls are free spaces in your home to use and fill as well as the floors! From filling your office space with photos and memos, to making a feature out of multiple mirrors which could open up your room and make it look instantly bigger. These IDdesign mirrors come in more varieties than we can choose, as you can pick styles which reflect your own taste. If you do have dark coloured walls in your flat the mirror trick works well to give the illusion of more space. You don't necessarily need to clutter as space can often be limited in Dubai, but adding your belongings and personal touches is important when making your flat look like home. From photographs to books and this star light we love from KARE, decorate your shelves with little mementos which say something about you and your style. If you want to follow the industrial theme then try rustic wood frames, steel accessories and using light bulbs as features.